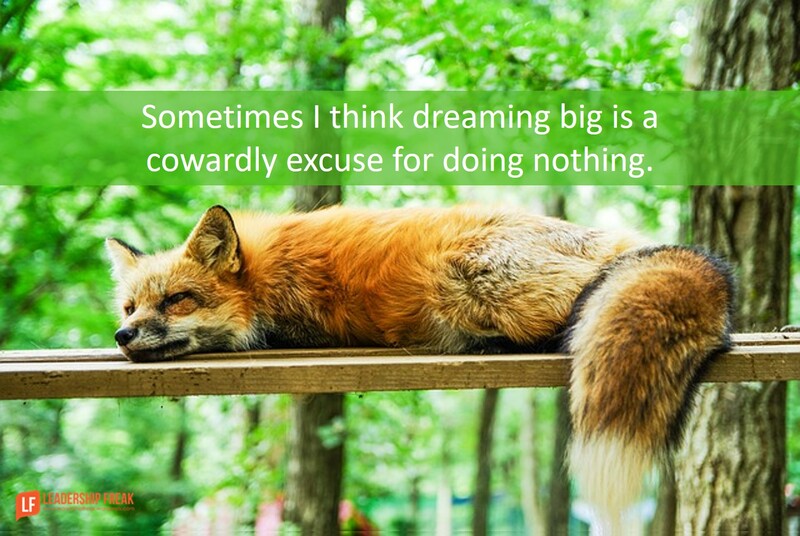 Sometimes I think dreaming big is a cowardly excuse for doing nothing. If we dream big enough, we can justify inaction today. Nothing’s ever big enough to achieve really big dreams. Leadership is earned by unremarkable daily practices. The fear of being unremarkable invites the pursuit of dramatic change. Simple unremarkable behaviors seem insignificant. In the end, stagnation prevails. Leaders don’t become remarkable when they reject the power of unremarkable behaviors. NFL hall of fame football coach Tom Landry didn’t win a game his first season. Steve Jobs and Steve Wozniak offered to give their idea of a personal computer to Atari in exchange for jobs in the company. Atari declined. The desire to make a difference doesn’t make you remarkable. Sincerity doesn’t overcome stagnation. Wanting change – while staying the same – wastes sincere desire. Desire to make a remarkable difference requires unremarkable beginnings coupled with unremarkable behaviors. Unremarkable behaviors lead to remarkable results. An affirmation given once a day becomes culture building. A coffee conversation shifts someone’s mindset. An introduction sparks a transformative friendship. Trying one more time finally delivers results. Unremarkable behaviors become remarkable when they are outward-facing and forward-looking. Serving yourself and fixing the past make you unremarkable in the worst possible way. The enemy of remarkable success is blindness to current opportunities. Great aspirations destroy potential until current unremarkable opportunities are firmly seized. Remarkable success is sustained by persistent personal development. Humility enables development – arrogance blocks it. Listening deeply to disappointment and frustration. You never grow while pretending things are just fine. Shifting a mindset from self-serving to other-serving. Connecting with mentors or coaches. Reflecting on both process and result. Theory without practice produces illusions of competence. What unremarkable behaviors make a remarkable difference? Dan, Excellent! It is in the little things, the unremarkable things, that major differences get made. #2 in the development list is very important for everyone. The way I phrased it when talking with my children is “It’s not all about you”. Dan, I have also generally found, from a selfish standpoint, it is much more rewarding and personally satisfying to do things for others than to do things for myself. Simple persistence in moving something forward, something that impacts others, is often simply remarkable. The collection of ideas for organizational improvement is one thing that I remember — a worker in a unionized milk plant once handed me a little spiral notebook with 20 pages of different ideas that he had for correcting issues and problems within the organization. It was an amazing toolkit for organizational development. Look at some of those stone walls on the old farms around the country. Built one stone at a time. If you see the Great Wall, you will see that persistence in spades. That kind of persistent effort can leave remarkable things behind. Thanks Dr. Scott. Persistence in something useful to others (including self-developement that enhances service) is at the heart of the matter. Like Churchill said, Never quit ….. 🙂 Keep up the great work. I appreciate that this supports the idea that anyone can grow into a leader–not that leaders are born to be leaders. The “unremarkable behaviors” that you listed have all, at one time or another, been a catalyst for productive change in my work and even personal environment. It is easy to look at those who have made grandiose changes and think, “Crap, I don’t have any huge ideas to make worldwide change as a leader,” but everyone can name one way that they can start small to work towards leading others to a better workplace, environment, world, etc. The power of a connected conversation over coffee should never be undervalued. The “let’s try again” mindset, each day, keeps us moving forward. Humble persistence, reaching out to learn from others, and a commitment to gratitude helps put one foot in front of another every day. Dig deep enough, and you find no one with a big idea that succeeded did it overnight. And they didn’t do it alone. Thinking on this…Remarkable results usually are the result of many little, unremarkable steps along the way. Put one foot in front of the other…unremarkable, Do it with pace…unremarkable, Do it for 26 miles, a marathon…remarkable. You nailed it, Will. I like the marathon metaphor. Short quick notes! Have taken a snapshot on phone to keep reminding me of these valuable points. Very well said. The desire to be remarkable, combined with the fear of failure are the enemies of real progress. This really connected with me! Thank you for this! I believe that you definitely have to be humble to understand that things can perhaps be wrong – in order to make them better. It doesn’t mean that everything is bad, but I am a firm believer in the power of change for the better; that small improvements can be made daily; that looking for what can be improved while celebrating quietly what is already good is the best policy. But an arrogant person thinks they know everything and doesn’t need anything to change which I think is nuts! No one has all the answers ever. Often the most junior employee has a great eye for change and in any event is worth listening to as there should have been a good reason why they were hired in the first place – and you will probably learn something about your business or yourself or the employee – all which is worth knowing. But you do need to know when to make decisions and when to “stick to your guns” rather than keep listening. There is a finite amount of time for most decision making. I think that all of these are “unremarkable behaviors” but have worked many places where the opposite is rewarded i.e. where only the highest salesperson is great, or the manager with the “new and stunning product” is any good at all etc. But these people often didn’t have the trust of their staff or their teams. Listening and actually hearing people is the most unremarkable trait of all in my opinion.